One of Greenville’s most special and elder citizens, Perley Hood, 100 years old, was honored with receiving Boston Post Cane. Suzanne AuClair, executive director of the Moosehead Historical Society was on hand at the Shaw Library in Greenville to meet Hood and present him with the historic cane. 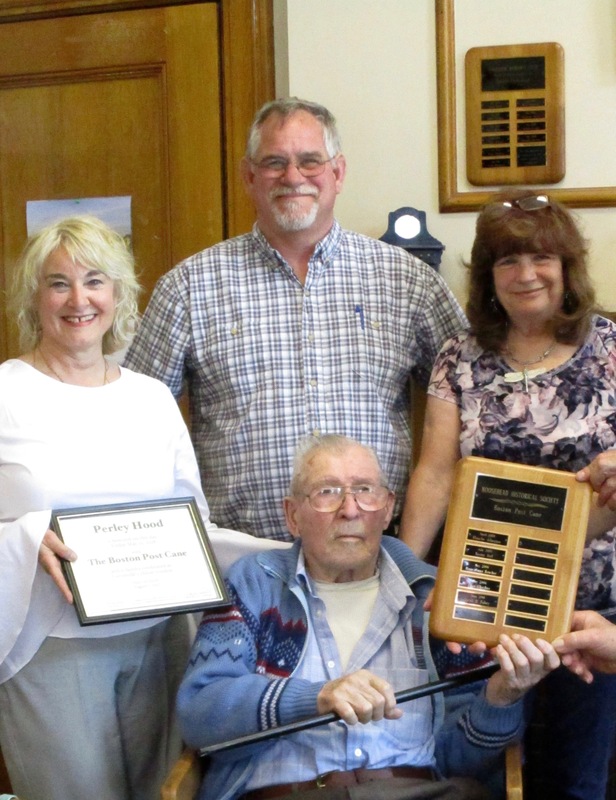 As it happened, it was also a Hood family reunion and many family members were at the library to celebrate their patriarch, along with Library Director Linda Wohlforth and Greenville Town Manager Jesse Crandall. Perley Hood was born on a small island in the Fairfield, Maine area Aug.1, 1917. At the time of his birth, World War I was raging in Europe. Labeled as “the war to end all wars,” with millions of people killed, the news of the terrible war was close to home for Perley’s parents. His father was born in Russia in the 1800s. He and his brother fled the country, traveling on foot through Russia to Poland and eventually securing passage to America and Canada. They changed their complicated Russian surname to Hood to make it easier to assimilate in their new country. They were both professional violinists in Russia, but spent their most productive years in the farming business. When rumors of another war loomed in 1936, Perley tried to enlist. He traveled to New Jersey and just happened to be in Lakehurst when he witnessed the fiery end of the Hindenburg, a huge zeppelin that was the pride of Nazi Germany. Perley was turned down by the army because he had no vision in one eye. He wasn’t easily dissuaded and went to a number of Army posts to enlist. They all turned him down. He did what he could to support the war effort from the sidelines. Always looking for something new, he discovered candlestick bowling and brought that game to Maine, specifically in Freeport. He built his alley near L.L Bean’s factory and first store. In addition he had an arcade for the kids, with pool tables and fast food being offered. He and Leon became friends. During his career Perley worked in the woods, was a cook at a woods camp, and helped build the Seboomook Dam. Later he worked as a valve tech at the Yankee Power plant and in his spare time could be found on the clam flats. Later, he and his wife settled in Greenville. He was a bundle of energy all his life and he hasn’t slowed down much. Through most of his nineties, he worked on his home on the Lily Bay Road. The Boston Post Cane tradition began as a promotional event only eight years before Perley was born. The cane is elegant, made of African ebony with a 24-caret gold embossed head. Originally, the canes were presented to the eldest male citizen in 700 towns throughout New England (for some reason Vermont and Connecticut were not included). The tradition carries on today and includes women. Unfortunately, there are very few of these canes left, so the presentation is mostly ceremonial, with a plaque or citation substituting for ownership of the cane. This entry was posted on July 24, 2018, in Uncategorized. Bookmark the permalink.